...Lorraine isn't the athletic type so she couldn't have won a tournament or any kind of sport. ...There isn't a napping competition or a coffee drinking competition so she couldn't have won those. ...The name of this post isn't I quit suckers so she didn't leave Greg to marry Adam Levine. ...The lottery numbers haven't been called yet so its not that. Nope, you are all wrong! It's none of those!!!! Well, what did I win on this lovely Saturday? I didn't win a thang (my attempt to sound Texan) but my students sure did! Yep, it's true my 4th grade little froggies are the winners of my participation in a FAB-U-LOUS literacy training that has changed (and continues to change) the way I teach. I was going to wait until the end of the year to write about this but for some reason after my day of training today I felt the need to share. So what am I talking about you ask? Abydos learning ( also known in my district as WIN (Writing in Northside). You can find them on facebook here or click their name above to see their website. It's my 11th year in Northside Independent School District (15th in teaching), all 11 years at the same school by the way... yes, I love my school that much to stay over a decade! Anywho, I never even heard of NJWP (New Jersey Writing Project) or Adydos or WIN until about 6 years ago when I was teaching third grade. DON'T KILL ME 4TH GRADE TEACHERS, I REPEAT, DO NOT KILL ME ... but as a 3rd grade teacher I thought, "why would I need to take a writing class? I already know how to teach Writer's Workshop and do so every day when its not close to Reading and Math testing season. I'm an awesome teacher because I have had 100% pass rate on Reading and Math TAKS (the state test at the time) and that's what its all about here in Texas, right?" Then I looped up to 4th grade with my class. Yes, it crossed my mind that now that I was teaching 4th grade I should attend this WIN training which I didn't know anything about except that was offered for three weeks from 8:00 - 5:00 during the summer. Low and behold, my first year teaching 4th grade I didn't have 100% passing TAKS but I had two students earn a score of '4' (out of 4) on the writing state assessment - the only 2 in the entire grade level at our school. That must of meant I knew what I was doing. I went to writing workshops in the summer throughout the years to perfect my craft (I say in my sarcastic voice). The state test became way more rigorous, in addition to being renamed STAAR AAAANNNNNDDDD - hold on to your britches folks - students in Texas were actually expected to start thinking. That's right, not just thinking about what book to read or thinking about what friends they'll hang out with over the weekend, but critically thinking about their learning!!!! Wha - What? Did this new expectation of including rigor in my teaching change how I taught writing? Nope, why change a good thing? Don't you remember, I went to workshops... I am a life long learner, taking writing workshops in the summer and perhaps some after school throughout the year. I've decided to make this "Saturday for the WIN" post several parts. This post is already getting too long and I haven't even told you what I've done in WIN yet. I signed up for the three week WIN/Abydos summer training and then dropped it before it even started, not just once, but several years in a row. Something always came up, my kids needed to be driven to Orchestra camp/Volleyball camp, or a zillion other activities, and to be honest I wasn't sure I wanted to give up 3 weeks of my summer for a "workshop". What would I learn in three weeks that I couldn't learn in the 1 hour workshops I was going to? WIN just wasn't a priority to me. Fast forward to last year when I asked myself, "Self, why do my students hate writing?" After some deep, deep soul searching reflecting I figured out that my students didn't like writing because I didn't like teaching writing! Woah! I hate teaching writing and I'm a fourth grade teacher? Yep, it was true! At the same time of this gigantic revelation in my life, I get an email from my district asking if I would be interested in taking the infamous WIN training if they offered it throughout the school year. Still not knowing much about WIN, I put myself on the "interested" list. Well, the stars aligned and everything must have been right with the world because I was invited to take the training this year. I don't mind giving up an occasional Saturday and I heard this WIN thing was pretty darn good. Ha! Don't you just love "Saturday for the WIN"? Get it, we take the training on Saturdays and its called WIN training.... we are winners because we are taking this Abydos training... on a Saturday? I'm ending this 'Part 1' right here, but before I do let me tell you that taking this WIN training has changed me as a teacher (for the better). I am only 1/2 way through this journey and I cannot tell you how much I LOVE teaching writing! I am so much more confident about teaching writing and the most FABULOUS part about the whole thing is that my students are excited to write!!!! Who knew that going through the PROCESS would make such a tremendous difference? 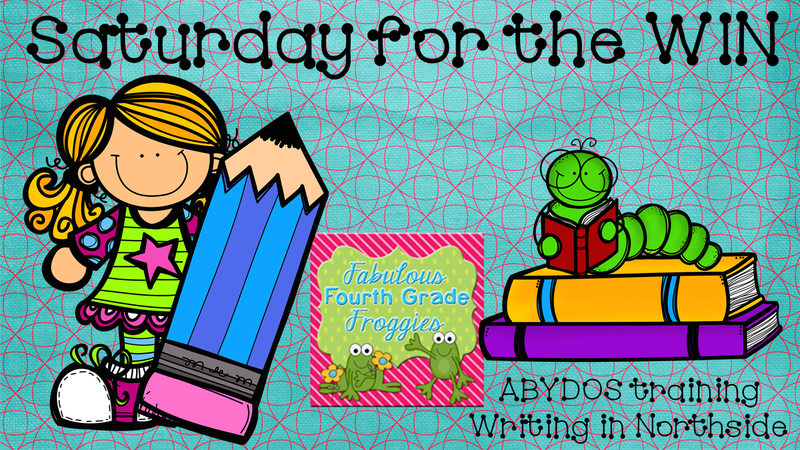 In part 2 of Saturday for the WIN, I will share what an incredible impact going through this process has made in me as a writer and how I implement what I experience in WIN with my students almost immediately (which I couldn't have done in the summer training). I also want to share the friendships and bonds I have made with my peers taking this training (who I didn't know previous to this) and tell you about my incredible trainers but that might have to wait for part 3. Here is the book we use.... it has become my best friend. I was blessed to receive it through this training but I can tell you it is worth every single penny! Have a wonderful weekend my frogilicous friends! Going through Abydos changed me as a teacher. It was the best PD I ever went through, including getting my masters degree. Becoming a trainer was even more powerful. Yes, it is a huge time commitment, but the payoff is fabulous! I'm so glad you decided to go for it! Your kids will benefit tremendously. Thanks Suzanne! I love it so much and its so worth the time commitment. Knowing what I know now I would do it even if it was my entire summer long. I am sure it has a lot to do with the fabulous trainers we have too!